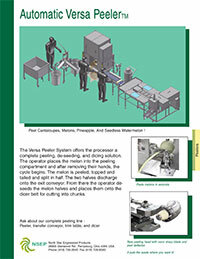 The Versa Peeler System offers the processor a complete peeling, de-seeding, and dicing solution. The operator places the melon into the peeling compartment and after removing their hands, the cycle begins. The melon is peeled, topped and tailed and split in half. The two halves discharge onto the exit conveyor. From there the operator de- seeds the melon halves and places them onto the dicer belt for cutting into chunks. 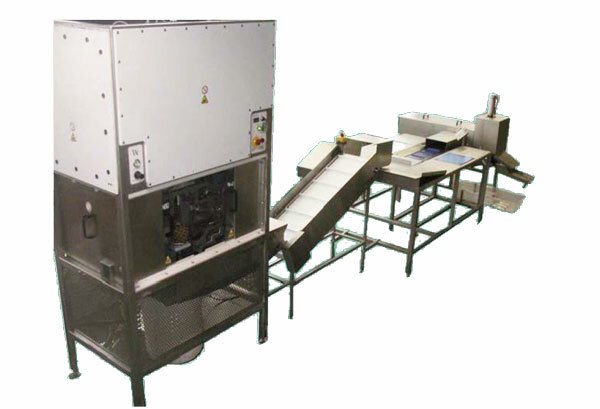 Ask about our complete peeling line - peeler, transfer conveyor, trim table, and dicer. Capacity Up to 6 melons / min. Dimensions 49" x 31" x 91.5"